Jo Napier admires her portrait of Annie Hamilton in the hallway of the Dean's Office. (Photo: Kenneth Conrad). All other photos provided by Jo Napier. If you've recently visited the Dalhousie Medical School Dean's Office, you've likely noticed some new faces. Displayed proudly in the hallway hang the portraits of the Dal Med Innovators: 12 men and women recognized during the medical school's 150th anniversary for their everlasting contributions to medical education at Dalhousie. 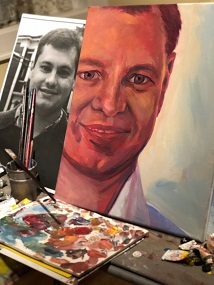 The portraits, hand-painted by Halifax artist Jo Napier, were displayed at a luncheon to honour Innovators and their families and at the DalMed150 Celebration Gala at the Halifax Convention Centre before being moved to their now permanent home on the second floor of the Clinical Research Centre. 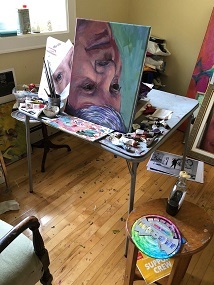 Napier, whose brother Luke and late father Robert are both Dalhousie Medical School alumni, was a journalist before shifting gears and deciding to pursue art as a career path, taking classes at Vancouver’s Emily Carr University of Art + Design and the Nova Scotia College of Art and Design. Introduced to art by her father, Napier recalls him painting to unwind in the evenings when he served as a family doctor in Bonavista, Newfoundland. Today, Napier's adopted daughter, Julia, inspired her niche of portraits of pioneering women. After two years spent researching the subject, Napier created her Great Women of Nova Scotia: The Nova Scotia Nine portrait collection, which featured Viola Desmond, Marie-Henriette (Granny) Ross and Anna Leonowens, among others. The series was eventually purchased by the Royal Bank of Canada for its national art collection and resides in the 14th floor boardroom of RBC Dominion Securities in Purdy’s Wharf. That project was followed up with two Great Women of STEM (Science, Technology, Engineering and Math) portrait collections: “Female Chemistry” and "Great Women of the Ocean, Earth and Sky," featuring women who won Nobel Prizes, created our star classification system and mapped the ocean floor – while raising a family, in some cases. 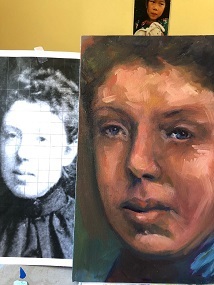 Napier recalls a moment, during her third portrait collection’s showing at the Chase Gallery in the Nova Scotia Archives, that left a lasting impression. Her method of placing large photos of her subjects around her house allowed her to form connections with people she'd never met. Now that the Innovator portraits have been completed (“I was exhausted at the end, but happily so,” she says), women in STEM is Napier’s primary focus. 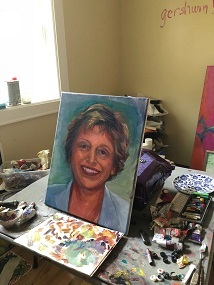 She’s launched her own company, Great Women Productions, to produce short, one-on-one video “interviews” with the subjects of her portraits to be shown at conferences and as educational tools. Napier envisions a different world when her daughter is old enough to pursue a career of her own.